Our Korczak friends in Brasil organised for the first time an integration camp for children with different backgrounds. The camp was held in Pirenópolis, near Brasilia, in the Central region of Brasil. 24 children, 12 from the north and 12 from the south took part with 8 educators and 5 people from Vaga Lume staff. The Dutch-Russian “Nash Dom” camps served as a model [Report]. Sylvia Guimaraes sent us a short full colour report. The Vaga Lumes Network Program (Translator’s note: Vaga Lume is the Portuguese word for “firefly”), carried out by the Vaga Lume Association since 2005, has as its objective to promote cultural exchange among children from the different regions of Brazil, encouraging the development of reading and writing, as well as integration among children. In 2008, two groups were communicating between the states of São Paulo and Pará. The Anchieta Project, an NGO located in the Grajaú section of the low-income outskirts of São Paulo, with four public schools from the small town of Castanhal, Pará; and the privately owned Oswald School, located in the Vila Madalena section of São Paulo, which corresponded with two public schools in the rural area of the town of Soure, Pará. Altogether, 1,600 children and over 60 educators from the two states participated. During the school year, the students communicated from a distance by means of two exchanges of materials: during the first semester, they talked about the topic “our environment,” and in the second semester they sent their reactions to the materials, commenting on their cultural and environmental similarities and differences. The materials are highly varied, each teacher working in the classroom with his/her students in keeping with their grade level, encouraging creativity and producing individual and group letters, scale models, crafts, games, etc. The initial projects on the topic “our environment” were exchanged in person during the Integration Camp of the Vaga Lumes Network held during the last week of July in Pirenópolis, Goiás, at the IPEC EcoCenter, which has a reference facility for education and sustainability. Each of the four participating groups (the Anchieta Project, the Oswald School, Soure and Castanhal) had an elected delegation made up of six children (10-12 years old) and two educators. The program and the activities were based on the ideas of Janusz Korczak. The pedagogical concept, the principles of justice, brotherhood, and equal rights and obligations were put into practice: distribution of tasks, incentives to autonomy, development of responsibility, and conversations reflecting everything the children wanted to debate (inspired by Korczak’s parliament and court); in this way, the children develop the progressive ability to deal with feelings and with conflicts. On returning home, the children prepared feedback in order to share the results of the Camp experience with their communities and present the materials received. The feedback takes place using exhibitions and cultural events for students, teachers, parents, and others involved in each community. After the feedback, the children prepare the replies to the materials exchanged to finalize communication for the year. 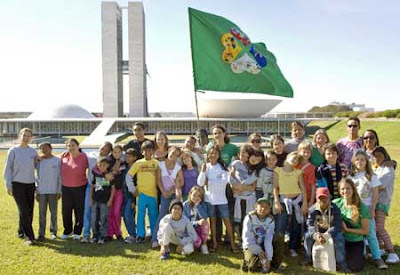 Since its creation, the Vaga Lumes Network Program has achieved the following results: 16,783 students participating from seven institutions in São Paulo and 49 schools from six towns in Amazonia; holding of the first Integration Camp in 2008 with 30 participants; publication of the book “Cartas, Pontes, Novos Horizontes” (Letters, Bridges, New Horizons), which will be launched at the beginning of 2009. The book addresses the exchange of experiences between public schools in the rural zone of the town of Portel, Pará and students from the Vera Cruz School in São Paulo, and comes with a DVD containing a film about the project. For the Vaga Lumes Network Program, the opportunity for developing expression, especially through writing and speaking, constitutes an important part of human growth.